So much squash. So little inspiration. The co-op farm we joined is producing a lot of squash. 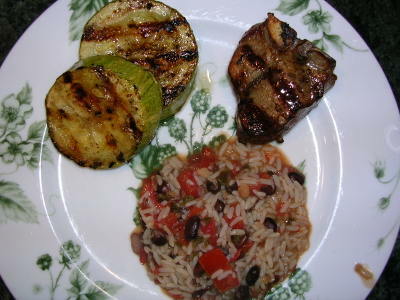 This recipe called just for yellow squash, but I combined yellow squash with zucchini. Let's face it, we have to throw the zucchini into anything we can during the summer. Anyway, it was pretty tasty, except you have to be careful about one thing. The recipe calls for you to drain the vegetables after you cook them. But I would advise you to drain them a second time, after you have mashed them. My casserole was just a bit watery, and I think a second draining would have helped. Combine squash, onion and salt in a large saucepan; cover with water and simmer until vegetables are tender, about 15 to 20 minutes. Drain and mash well. Stir in milk, eggs, melted butter, flour and cheese. Add salt and pepper to taste. (At least imagine the taste - with those raw eggs in there, it's not like your going to stick your finger in.) Preheat oven to 350 degrees. Bake in buttered casserole for about 40 minutes. Preheat oven to 450 degrees. Prepare one pie crust and line 9-inch pie plate. Wash and drain berries well. Sprinkle sugar, tapioca and lemon juice over berries, and mix gently. Let stand while preparing topping. For topping, cut together flour, brown sugar and butter. Mix with pastry blender, or two knivs, until butter pieces are the size of small peas. Stir in oats. 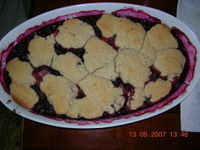 Pour berry mixture into pie crust. Sprinkle topping over berries. Bate at 450 for 10 minutes, then reduce heat to 350 degrees and continue baking for 35 to 40 minutes, until topping and crust are nicely browned. Stir together broth, soy sauce and cornstarch until cornstarch has dissolved. (Original recipe also adds a 1/2 teaspoon of salt here, but I found it plenty salty without adding more.) Coat pan with peanut oil. Add garlic and stir-fry until pale golden. Add half of bok choy and stir-fry until leaves wilt, about 2 minutes, then add remaining bok choy and stir-fry until all leaves are bright green and limp, 2 to 3 minutes total. Stir broth mixture, then pour into wok and stir-fry 15 seconds. Cover lid and cook, stirring occasionally, until vegetables are crisp-tender, 2 to 4 minutes. Stir in sesame oil, then transfer to serving dish. Turnips are turnips. That is, they have a strong taste. I wanted a kind of light side dish, and I can't say this completely qualified. The lemon zest gave it a somewhat summer-y touch, but they were still, well, turnips. The Weatherman ate them, but not with great relish. In a large saucepan of salted boiling water cook turnips 15 minutes and drain. When turnips are cool enough to handle, cut each into 8 wedges. In a large skillet cook turnips in butter over moderate heat, stirring occasionally, until almost tender and golden on edges, about 10 minutes. Stir in bread crumbs, parsley, zest and salt and pepper to taste and cook, stirring occasionally, about 5 minutes. The Weatherman got well treated on Father's Day. For lunch he was served grilled chicken, homemade cole slaw and brown rice salad with sugar snap peas, dill and scallions. This was all so healthy that for dinner he got his real favorite - spaghetti with meat sauce, along with homemade garlic bread and salad. In the midst of preparing all this stuff, I casually threw the question, "Would you like brownies for dessert?" his way. The answer: Yes. Here's the recipe. I'm also throwing in some photos of other parts of the meal. -melt two 1 ounce squares of Baker's unsweetened chocolate. Let cool. -cream one stick of softened butter with one cup of sugar. -add 1 teaspoon of vanilla extract and two eggs to sugar and butter, mix thoroughly. -add cooled melted chocolate to mixture. -sift and stir in 1/2 cup flour and a pinch of salt. Bake at 350 for about 25 minutes or so. This makes a nice change as a side dish, and it couldn't be easier. Prepare orzo (the rice-shaped pasta) according to package directions. When it is cooked, drain and put into a bowl. Toss it in some olive oil - enough to moisten through. 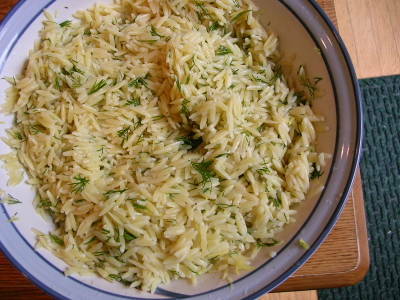 I made half the box of orzo, and then added the graded rind of one lemon, and then all the juice of the lemon. I threw in some chopped dill, added salt and pepper to taste, and voila! If you are making the whole box, just add more olive oil, and use two lemons - rinds and juice and probably a whole bunch of dill. 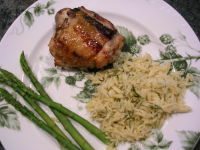 I served this with grilled chicken and asparagus, but you know how I am about grilled chicken and aspargus. Pay no mind to this weird, orange-y photo. This veal looks pretty and tastes good. 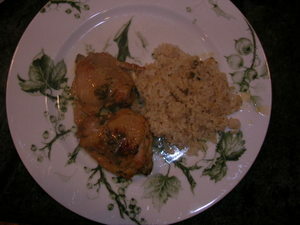 This recipe was adapted from the Silver Palate cookbook. Basically, you melt some butter (somewhere between 1 and 2 tablespoons) with some olive oil (ditto on the quantities). Chop up a shallot and a scallion, and saute them for a few minutes, then add the veal scallops. (Before you cook them, grind some fresh pepper on each side. I also lightly salt them.) I had one package that had four scallops. Brown the meat but don't overcook it - just a few minutes on each side. Take the veal out of the pan and set it aside. Then add some white wine to the pan (about a 1/4 cup) and scape up the browned bits of shallots. Let the wine boil down a bit, and then whisk in about a two tablespoons of Dijon mustard, and about 1/4 cup of either heavy cream or whole milk, depending on your guilt factor. Cook for a minute or two, stirring in any juice that has accumulated on the plate where you rested the veal. 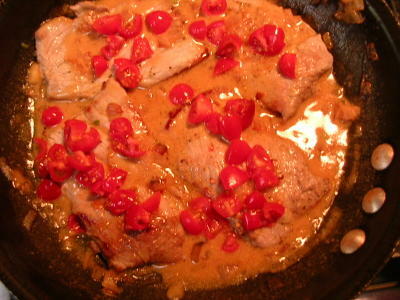 Add the veal back to the sauce, and then sprinkle with fresh chopped tomatoes. I served this with brown rice and a green salad. I just read that George W. Bush and Vladimir Putin dined on red caviar and veal loin. We did not. Tonight I made chicken teriyaki, brown rice and an odd clean-out-the-refrigerator salad. OK, it's worse than you think. 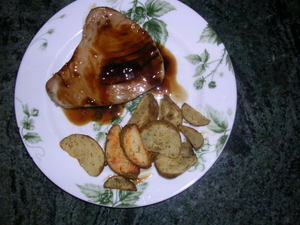 I used a McCormick seasoning packet of ginger teriyaki sauce. It was good. It really was. You mix the packet with some water and oil and then marinate the chicken in the sauce for at least 30 minutes. 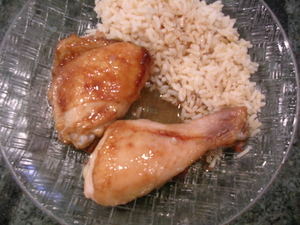 I marinated mine - thighs and legs - for about an hour and a half, then baked it at 350 for an hour. The rice was the rice. 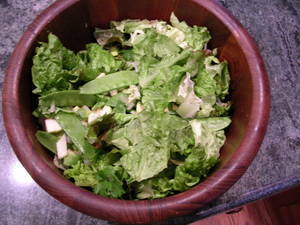 For the salad, I had red leaf lettuce and then a bunch of stuff from the refrigerator - snow peas, half of a Granny Smith apple (which I chopped), an avocado, some chopped cilantro and some Vidalia onion. I mixed it all together and just used a vinaigrette dressing. It was good - I can't describe the flavor - I guess it was vaguely Asian. Anyway, it was no State dinner, but it was tasty and healthy. I have written before about an easy short cut of Cibo Natural Brand pesto sauces. This made last night's dinner extra-easy. I cooked up a pound of gemelli pasta. (I wanted left overs.) I tossed it in a full jar of Cibo Artichoke Lemon Pesto Sauce, which is available at the A & P, and I'm sure plenty of other grocery stores. I also added a about a quarter cup of boiling water that I scooped out of the pot jut before draining the pasta. I had leftover asparagus from the night before, which I cut into bite size pieces. I then tore into pieces 1/4 pound of prosciutto. I used the cheap, domestic deli kind (yup, the A & P again) but the dish would probably be even better if you went with high end prosciutto. 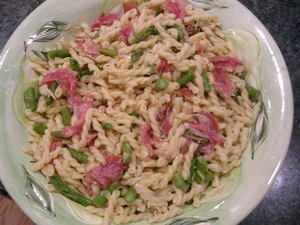 That's it - tossed together the pasta, pesto, hot water, asparagus and prosciutto. Yum Yum. 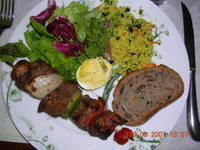 I served this with a salad of soft butter lettuce and sliced pears. Happy Spring! Grandmother Lawson's Sour Cream Enchiladas JUST WON'T GO AWAY! I KNOW, I KNOW - you keep seeing this photo and recipe of my grandmother's enchiladas. But a very weird thing keeps happening. Every time I try to post this blog to the "food and drink" column, it shows up on the main page. I can not get it to move. I've tried deleting it, reposting it and everything else I can think of, and it just wants to show up front and center of this blog. This has never happened before. If I ever doubted the after-life, I'm having second thoughts. I can't help but wonder if my late Grandmother Lawson (born in 1899) has something to do with this. Grandmother, they are wonderful enchiladas -but please - let me put them where they belong, with the rest of the food entries! OK - I have been working with tech support on this - bear with me and I hope to have this dish and recipe back where it belongs soon. Meanwhile, I am afraid it's just going to keep reappearing. Spooky. 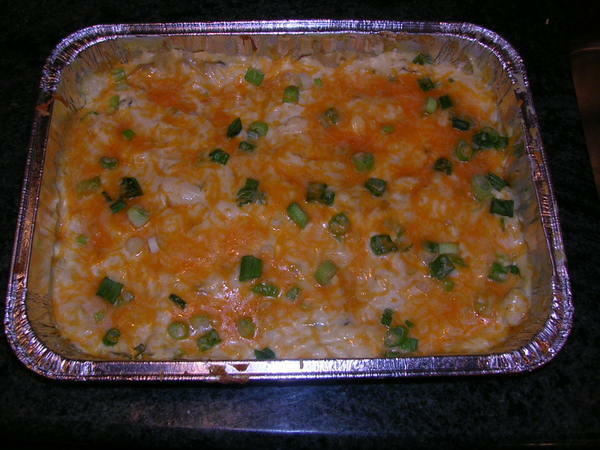 Layer your casserole with tortillas, sauce and cheese mixture until casserole is filled. Bake at 350 degrees until bubbly - about 15 minutes or so. For some reason I decided to microwave the tuna steaks, and they weren't bad. I marinaded them in a teriyaki glaze for about 30 minutes in the refrigerator.Then I covered the glass pan with plastic wrap and microwaved the two steaks on high for 8 minutes. They came out pretty moist and tasty. I served them with roast potatoes. But the real triumph was the spinach salad. I usually make it with some sliced Vidalia onion (you know, the sweet, mild onions) and orange slices. Today I used clementines, because I had them. But I added one more ingredient that I had never included before - some fresh, finely chopped ginger. Yum, yum, yum. The whole meal had a slight, Asian taste to it, and seemed fairly healthy too. Or would have been, if the Weatherman and I hadn't gotten into the Caramel, slow-churned ice cream afterwards. Now who brought that home from the grocery store?! I've been feeling like we've eaten too much meat lately. So I came up with this vegetable pasta sauce. I also broke up a head of broccoli into florets and steamed them. As everything else was cooking, I sliced some black olives. Then everything went into the pan (the one with the onions and garlic) and I added marinara sauce. OK - it was from a jar, but it was Rao's, and it was tasty. Served it over linguine. The Weatherman usually likes his meat, but he was very happy with this dish. 1. 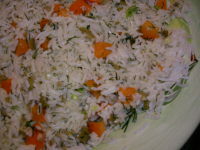 Transfer rice to mixing bowl and pour 1 1/2 cups vinaigrette into rice. Toss thoroughly. Cool to room temperature. 2. 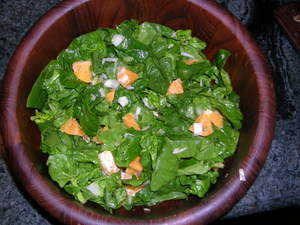 Add remaining ingredients and toss thoroughly Taste, correct seasoning, and add additional vinaigrette if you like. 3. Serve immediately, or cover and refrigerate. Return to room temperature before serving. 1. Measure mustard into a bowl. Whisk in vinegar, sugar, salt, pepper and herbs to taste. 2. Continue to whisk mixture while slowly dribbling in olive oil until the mixture thickens. Adjust seasoning to taste. Cover until ready to use. If necessary, whisk again before serving. Last night was The Boy's final evening home before returning to college. His sister came up from the city to say goodbye. I wanted a dinner that was a little more festive than usual, but homey and comfort food too. Which is why I went with mustard chicken. The recipe is from Laurie Colwin's book "Home Cooking." This is the recipe as she writes it: "The chicken is cut up and coated with mustard into which some garlic has been grated, along with a little thyme, black pepper and a pinch of cinnamon. 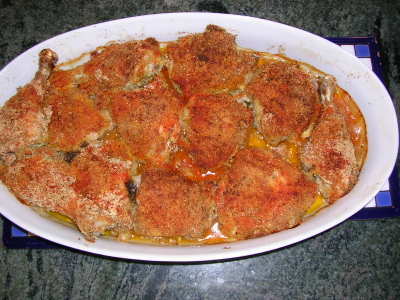 It is rolled in fine bread crumbs, dusted with paprika, dotted with butter and cooked at 350 degrees for about two hours. It can be served hot or at room temperature and it will never let you down." I used chicken thighs and legs, and I have never grated garlic in my life, so just chopped up 3 cloves finely. (I like stuff very garlicky though, so adjust accordingly.) Also I think 2 hours of cooking is excessive - I baked the chicken for 1 and half hours and that was plenty. I served it with creamed spinach and thin egg noodles. Yum. Yum. Last night, our friends Amy and David came over for New Year's Eve dinner. We decided on a pot luck meal. I provided the appetizers, first course and main course. Amy brought the side dishes and dessert. I think she ended up doing more work than I did, but however it shook out, all four of us got to enjoy a delicious meal. Appetizers were steamed shrimp, along with a smoked fish spread on small squares of pumpernickel bread. First course was Florida stone crab claws, which had been a Christmas gift from my parents, flown from the Florida Keys. 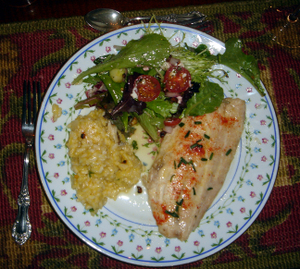 Main course was yellow tail snapper, butternut squash risotto and salad. For the snapper, I made a marinade of honey, orange juice and lime juice. The fish marinaded for about an hour and a half. Then, I took the fillets out of the marinade, dusted them with paprika and salt, put them in a greased dish and baked them for 20 minutes at 350. While the fish was baking, I boiled the remaining marinade down, and then spooned it over the fish for serving. For a garnish, I sprinkled some fresh chopped chives on them. 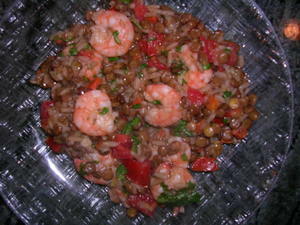 Here's a link to the recipe for Amy's risotto. She added shitake mushrooms to the onions - it was delicious. I don't have her recipe for the salad, but it included sugar snap peas, candied walnuts, cherry tomatoes, mixed greens, beets, goat cheese, and the base of the salad dressing was a Dijon mustard - not Grey Poupon, mind you, but one that she bought in France. 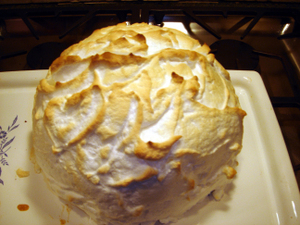 The Baked Alaska was also an incredible triumph, and I have to show it to you both as it came out of the oven and once it was cut into. 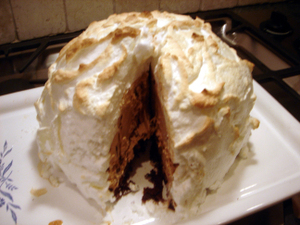 What you see there is mocha chip ice cream on top of brownie and surrounded by meringue. By the way, Amy mentioned she had an extra pass to her gym for this week. I think I'll waddle over to her house and borrow it. My book group meets for pot luck dinners. As the evening approaches, the host sends out an email, asking what people would like to bring. Almost immediately, there is a rush of people offering to bring bread and/or seltzer. 1. Preheat oven to 400 degrees. Lightly oil a large, low baking dish. 2. Bring a large pot of water, at least 5 quarts, to a rolling boil. 3. Detach florets from the cauliflower at the base of their stems. Add to boiling water with 2-3 Tablespoons of salt and cook for 5 minutes or until al dente. Refresh with cold water, drain and reserve. 4. Saute the garlic and parsley in extra virgin olive oil over low heat until the garlic begins to color. 5. 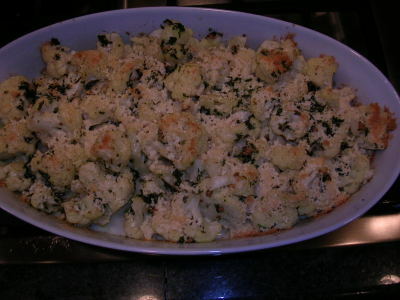 Put the cauliflower in the prepared baking dish, top with the garlic and oil, and sprinkle with salt, pepper, and grated cheese. Bake for 15-20 minutes or until cheese is browned and crusty. 6. Explain to your editor that you will get him those inserts and re-write the top of the article by tomorrow morning at the very latest. This recipe came from "Red, White & Greens: The Italian Way with Vegetables" by Faith Willinger. I cut up an onion and sauteed it in vegetable oil. I had some boneless chicken thighs, which I cut into strips and then added to the onions. After the chicken was cooked through, I drained off the extra grease, and then added a bottle (here comes the lazy part) of Trader Joe's curry and simmer sauce. I simmered the whole thing while cooking up some basmati rice. 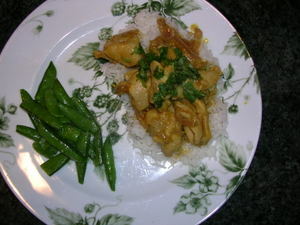 I served this with fast-and-dirty ginger snow peas. That is, I cooked frozen snow peas in the microwave half way through, and then added about a teaspoon of butter and a squirt of this ginger paste that I found in the vegetable section of the grocery store. Finished cooking the snow peas and stirred up the butter/ginger mixture around it. The curry was served with fresh, chopped cilantro. I added some shredded coconut; the Weatherman did not. Fast, easy, tasty. A cool fall evening. A fire in the fireplace. And such a yummy dinner! 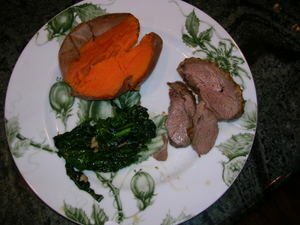 I served lamb, sweet potatoes and spinach. The sweet potatoes were just baked, and the spinach -fresh and from my favorite farm stand - was quickly sauted in olive oil and chopped garlic. And then I put just a tiny dash of soy sauce in it. As for the lamb, I swear by Julia Child. This recipe is for half a leg of lamb, but it's also fine for those smaller lamb roasts from New Zealand that you see around so much these days. Just cut the recipe in half. Coat meat with mixture. Roast 1 to 1 and 1/4 hours at 350. This gingerbread is perfect for the holidays, though I could eat it all year long. The only tricky thing about making it is that the cake always falls. I find this to be true no matter what I bake it in and for how long. But don't worry - it is so delicious no one will care what it looks like. I'm pretty sure this recipe originally comes from Bon Appetit. Sift first 6 ingredients into a medium bowl. Combine sugar, oil, molasses, water, eggs and fresh ginger in large bowl, whisk together. Mix in crystallized ginger. Stir in dry ingredients. Pour into pans and bake until tester inserted in center comes out clean - about 60 minutes - longer if you use one pan. Serve with fresh whip cream. Everyone will love you. I get a lot of nice complements on my pies. I don't make really fancy ones - just your basic apple, blueberry, peach and pumpkin, depending on the season. Pies aren't that hard but for some reason they impress folks. 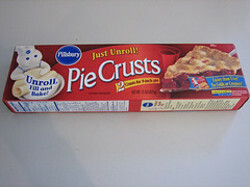 But I've always had this dirty little secret - Pillsbury Pie crust. It is shamefully easy - you just unroll it and boom - butter and flour your pie dish and you're ready to go. You can also cut them up and make lattice crust tops, which look very fancy. Still, when people raved about the pies, I'd mumble something about the quality of the peaches or that the secret of apple pies is just the tiniest bit of grated lemon zest. But never, ever did I discuss the crust. Yesterday, I read about an apple pie contest held at the Fall Harvest series (whatever that is) at Fortunoff (a place I've never been), which was judged by chef Peter X. Kelly and some pr guy. Now I do know Peter Kelly's cooking and it is superb. ANYWAY, the point is - and I do have one - that the prize winning pie was made with Pillsbury pie crust. Hah! Hats off to the cook, who has come out of the closet with this heretofore shameful secret. Ok, I know this is a photo of a raw salmon fillet. That is because I was so excited over last night's dinner that it went right from the oven to the table, and I completely forgot to take a picture. This recipe - so easy and so tasty - came from my niece Emily. Whisk together honey, soy sauce, lime juice, mustard and water. Marinate salmon overnight (I just did it for a few hours). Preheat oven to 375, and place salmon on baking sheet. Bake salmon for approximately 15 minutes. 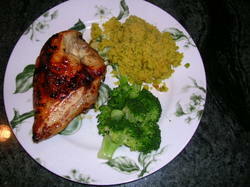 At the same time, heat marinade and reduce it in pan on stove. 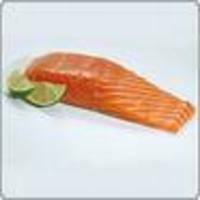 When salmon is cooked, spoon marinade over each piece of salmon. I got this recipe from Gourmet Magazine. Sprinkle chicken with 2 teaspoons coarsely ground pepper and 1 teaspoon salt. Heat oil in heavy skillet, then brown chicken, skin side down first, turning once, 8 to 10 minutes total. Transfer to a place, discarding oil. Wipe out skillet, then boil remaining ingredients until reduced by half, 3 to 5 minutes. Return chicken to skillet and braise, covered, turning once, until chicken is cooked through, 25-30 minutes. Transfer chicken to a platter. Boil sauce to thicken if necessary. Whisk sauce if separated, the pour over chicken. I used chicken thighs instead of a whole chicken. Served it with brown rice and green salad. Seasonal and easy. I love broccoli, but plain old steamed broccoli can get boring over time. 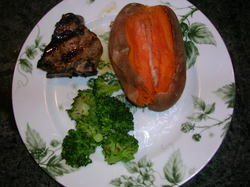 For two recent dinners - one with baked chicken and curried couscous, and the other with lamb chops and baked sweet potatoes - I made broccoli two different ways. Both are simple but just add a little flavor to the veggies. Variation 1 - while the broccoli is steaming, mix together two tablespoons of extra virgin olive oil with the juice of half a lemon. Add freshly ground pepper. 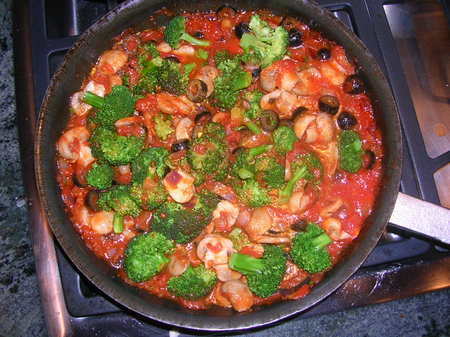 Toss the steamed broccoli in the mixture and serve. Variation 2 - chop of two or three garlic cloves. Saute them in about three tablespoons of olive oil. While the garlic is cooking, shake some red hot pepper flakes in - about a teaspoon. When the garlic is crunchy (but hopefully not burned), toss the steamed broccoli into the garlic/pepper/olive oil dressing. I like to add some salt, but I over-salt everything. 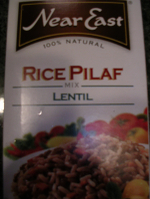 This one-dish dinner started with a mix - Near East Rice Pilaf Lentil mix, to be specific. While this was cooking - it takes about 35 minutes, according to the box directions - I sauteed a pound of shrimp and two cloves of chopped garlic in a tablespoon each of butter and olive oil. Once that was cooking, I chopped up one large, ripe tomato and about a third of a cup of fresh cilantro. Once the rice/lentil mixture was cooked, I stirred in the shrimp (along with the buttery garlic sauce it was cooked with), and added the tomatoes and cilantro. This dish was a big hit with the Weatherman, who really enjoyed the lentils as a change of pace from the usual pasta or rice. Nice, huh? The other day I bought an odd looking vegetable there. 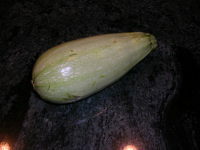 It looked like a swollen cukecumber, but it turned out to be a squash. 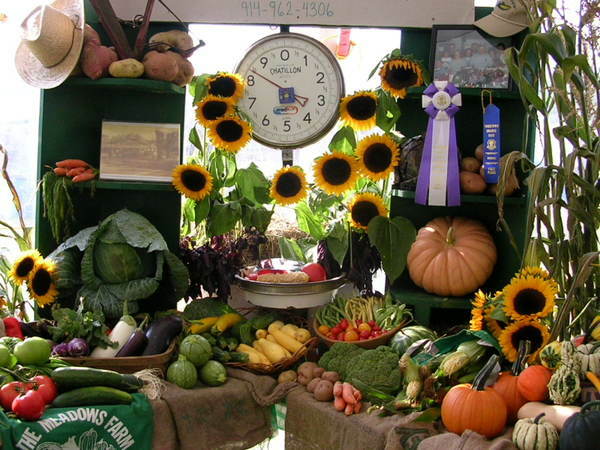 I wasn't sure how to prepare it, but as luck would have it, when I was at the farm stand yesterday, I ran into Jonathan Pratt, who owns Peter Pratt's Inn, a wonderful restaurant, also in Yorktown. I asked him what to do with this squash, and he said to slice it thick ("like steaks"), marinate it, and grill it. That's just what I did - I brushed it with olive oil and some herbs. The Weatherman grilled lamb chops (they were brushed with a mixture of olive oil, crushed garlic and coarsely ground pepper). He cooked the meat and the vegetables for the same amount of time. Meanwhile I made rice, bean and tomatoes. As you can see, the Empty Nest is still producing meals. I sauteed some onion and garlic in olive oil until they were soft. Then I cut up the meat I had from some leftover chicken thighs. (That was not the forgotten meal - my daughter, who now lives in Brooklyn, came up to dinner on Labor Day, so it didn't count as empty nest dining.) I stirred in the chopped chicken, and added a can of stewed tomatoes and simmered it for awhile. At the last minute, I threw in some fresh basil. I served it over spaghetti and then added freshly ground Parmesan. The Weatherman seems relieved that the kitchen is still producing meals, even though there are only two place mats at the table. It was early evening, pouring rain, the cupboard was relatively bare and I was NOT going to the grocery store. 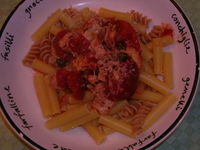 So here's what I came up with - pasta with tuna and capers. Saute some chopped onion (about 3 tablespoons) in olive oil. 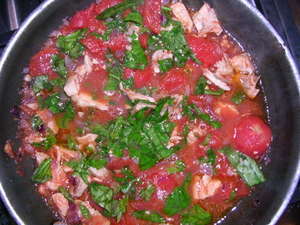 After they are softened, add a can of stewed tomatoes, about 1/4 cup of capers and a 6 ounce can of tuna. Simmer all this together while you are cooking whatever pasta you have on hand. I had half a box of ziti and a quarter box of whole wheat fusilli and I cooked both of them. I served the sauce on top of the pasta and grated Parmesan cheese over it. Savory, tasty - and all stuff that was already in the kitchen cabinet. I bet you think I never cook anymore. OK - I have cut WAY back both because it's summer and we've been traveling a lot, and my kids weren't around. But this weekend everyone was home and I was back at the stove. On Saturday night, I made lemon chicken and rice salad. 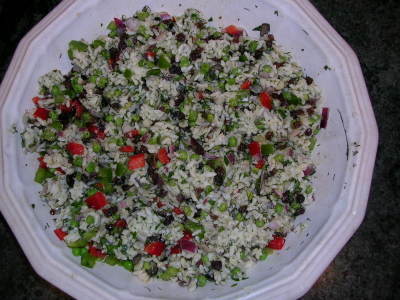 I kind of made up the rice salad but it turned out really well. At first, I was upset that I was out of Uncle Ben's rice, which I standby. But I went with jasmine rice and it worked out fine. I cooked the rice, cooled it and tossed it with a light vinaigrette. Then I chopped up and added the following: 3 scallions (white and green parts), about half of a large jar of green olives, a large yellow tomato (happened to have the yellow, but any kind would do) and a bunch of dill. It was pretty and a nice change from pasta. 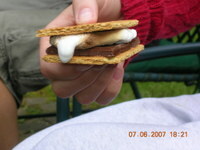 Come on - what is more delicious than S'mores? You probably remember them from your camp days. The recipe is simple: Take half a graham cracker. Place a few squares of Hershey's chocolate on it. Roast marshmallow. Place warm, gooey marshmallow on chocolate squares. Top with the other half of the graham cracker. (This will allow the chocolate to melt.) Smoosh and eat promptly. 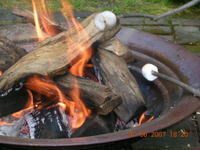 We have a fire pit at home, so we could roast the marshmallows in the backyard. 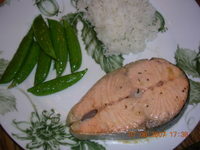 Dessert was proceeded by a healthy dinner - salmon, rice and sugar snap peas, stir-fried in ginger and oil. It was good, but not as good as those s'mores. Naturally, I cooked for my mother on Mother's Day. Also for my Dad, my sister, my niece, my brother, my sister-in-law and the Weatherman and the Boy. We started out with guacamole, salsa and chips. For the guacamole, I took four slightly over ripe avocados, and smushed them with an old potato masher. Then I added the juice from two limes. Stirred in some fresh chopped cilantro (probably about 3/4s of a cup) and some chopped Vildalia onions (about 1/2 a cup). Seasoned the whole thing with a few shakes of the Tabasco bottle, and salt and pepper. As for the salsa, I didn't make it from scratch, but I started with Pace chunky salsa, then doctored it up a bit by adding some fresh cilantro and sweet onions. Pour couscous in a medium bowl. Melt the butter in the boiling water and pour over the couscous. Cover tightly and allow the couscous to soak for 5 minutes. Fluff with a fork. Whisk together the yogurt, olive oil, vinegar, curry, turmeric, salt and pepper. Pour over fluffed couscous and mix well with fork. Add the carrots, parsley, currants, almonds, scallions and red onions; mix well and taste for seasonings. Serve at room temperature. For dessert we had fruit cobbler. This comes from the William-Sonoma catalog. Preheat over to 375 degrees. Lightly grease a baking dish. To make filling, toss berries in a bowl with sugar, flour, zest and salt. Pour into baking dish. To make the topping, stir together flour, sugar, baking powder, cinnamon and salt. In another bowl, whisk egg, buttermilk, butter and vanilla. Pour wet ingredients into dry ingredients; fold gently to form a soft dough. Drop heaping spoonfuls onto fruit, spacing them evenly. Dough will not completely cover fruit. Bake until fruit is bubbling and topping is browned, about 45 minutes. Needless to say, this should be served with vanilla ice cream. 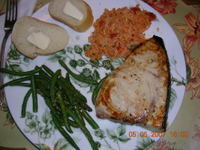 I am always nervous about grilling swordfish, because it is so damn expensive and so easily ruined. But last night, it came out really well. I had marinated the fish for about a half an hour in one of those - I'll admit it - pre-made lemon marinades. I set the grill low, on medium, and grilled the fish (the steaks were about an 3/4 of an inch thick) about five minutes a side. Served it with the left-over tomato-cheesy rice and some steamed green beans which I tossed in a little butter and about a teaspoon of country-style (grainy) Dijon mustard.